This past week as I attempted to find some balance in my professional and personal life, I spent time on vacation with my family and for the most part disconnected the part of me who is a connected educator and an admitted workaholic. 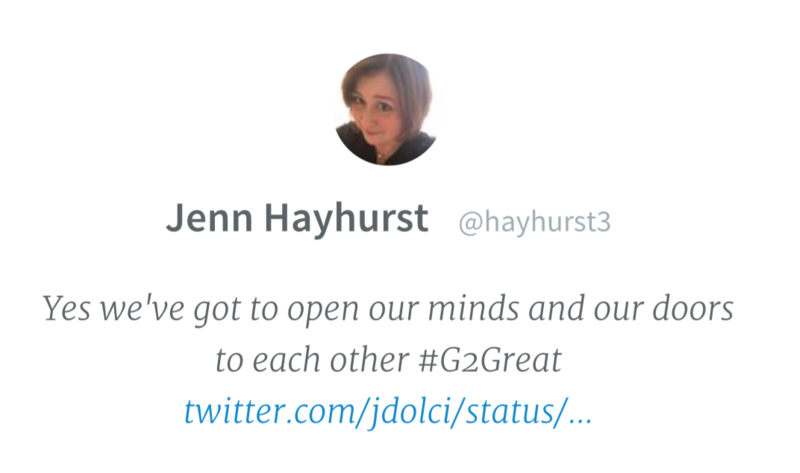 I am proud to say I was present with my family, which was long overdue and I even missed our #G2Great chat this week. 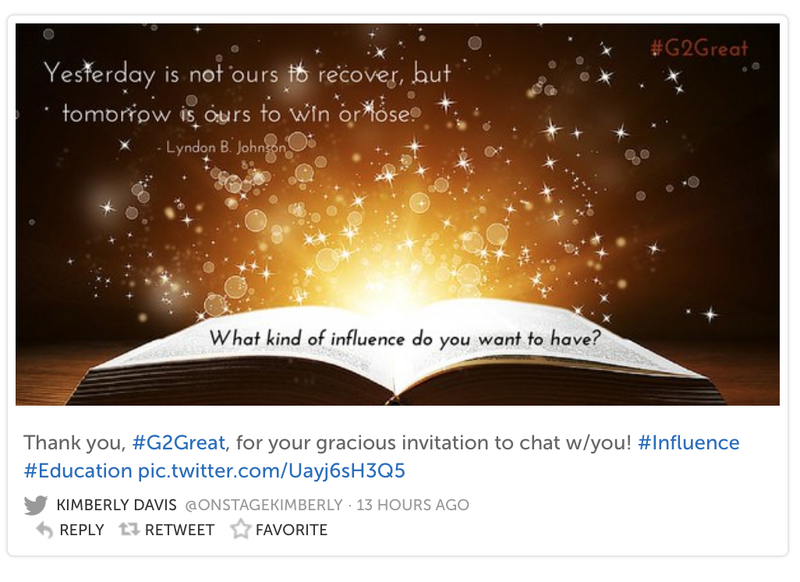 This was a challenge for me especially since it was my turn to write for the blog following our chat. 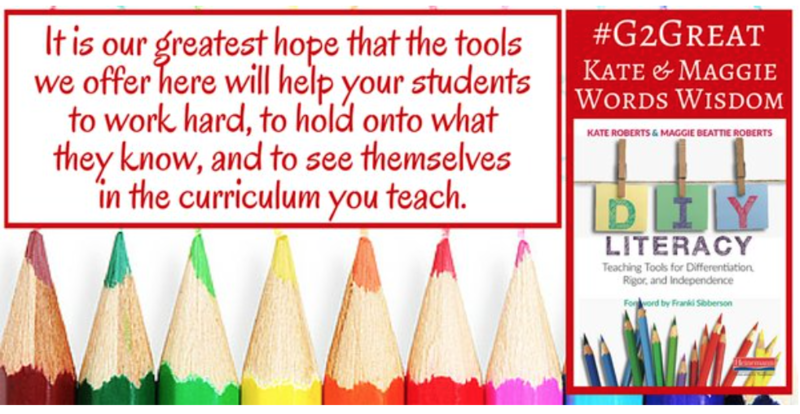 Thanks to my partners in literacy, @DrMaryHoward and @hayhurst3 I was able to spend this much needed time with my family, then return home to read the Storify and dive right into the chat and write the blog. 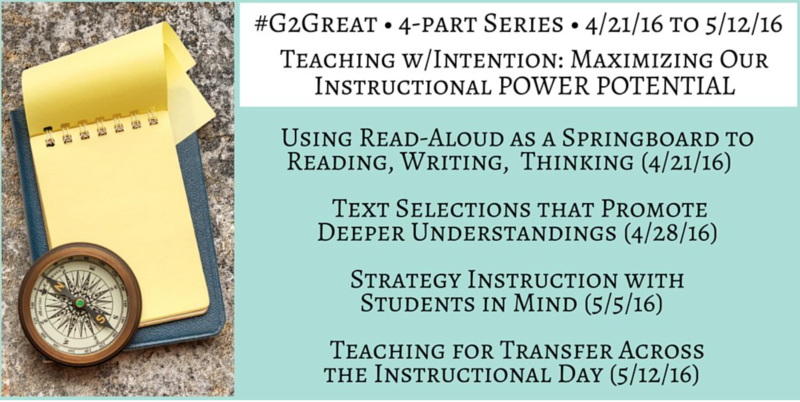 This week we asked questions about Text Selections that Promote Deeper Understandings as part of our 4-Part series Teaching with Intention: Maximizing Our Instructional Power Potential. 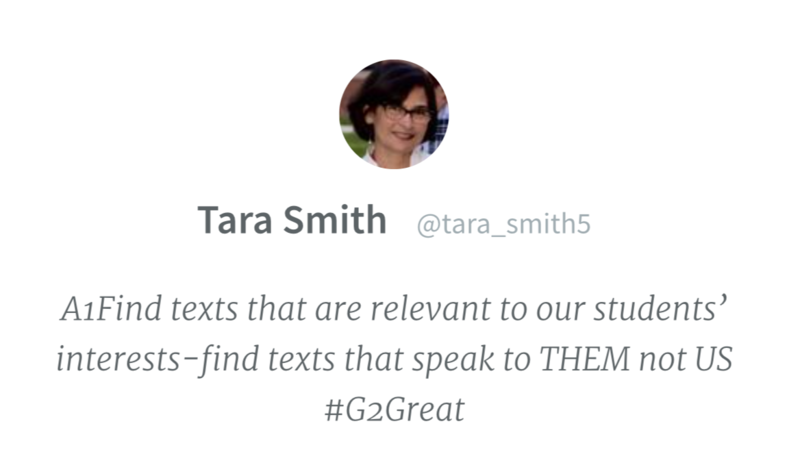 As happens each week, educators joined in at #G2Great to answer the questions and think collectively as we shared and learned about ways to choose texts that promote deeper understanding for our students. 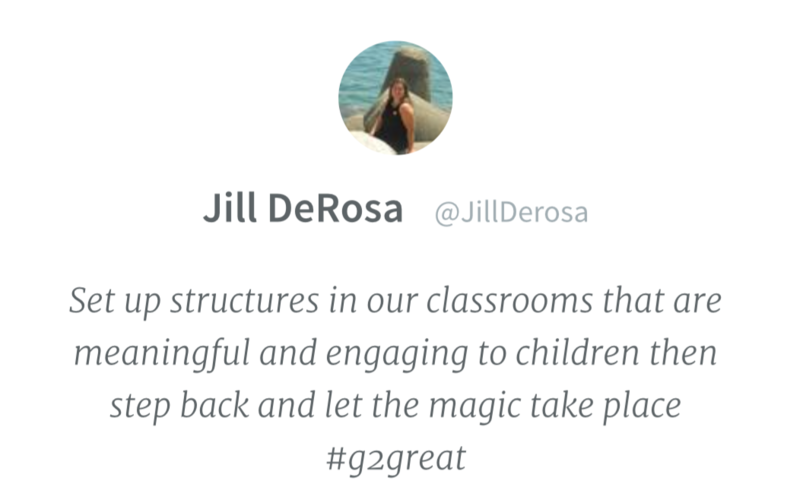 It is always the community of educators that comes together to share ideas that grows my thinking and pushes me towards continued growth and deeper understanding. 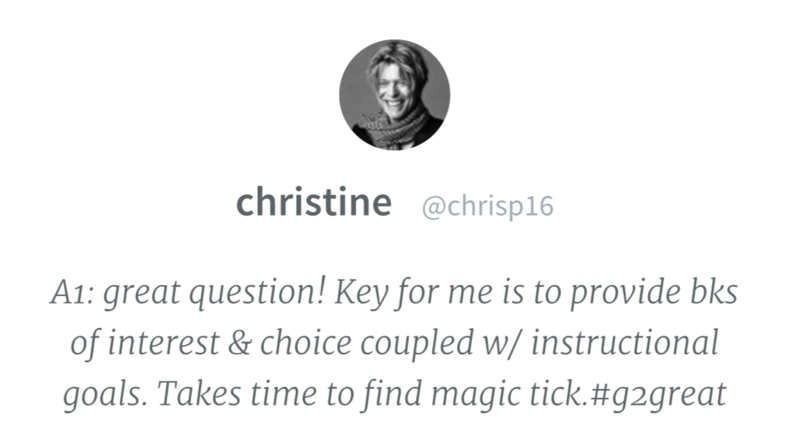 As I read through the Storify archive there were certain words that came to my mind as I considered the responses to each of our questions. When choosing texts thoughtful educators are intentional. 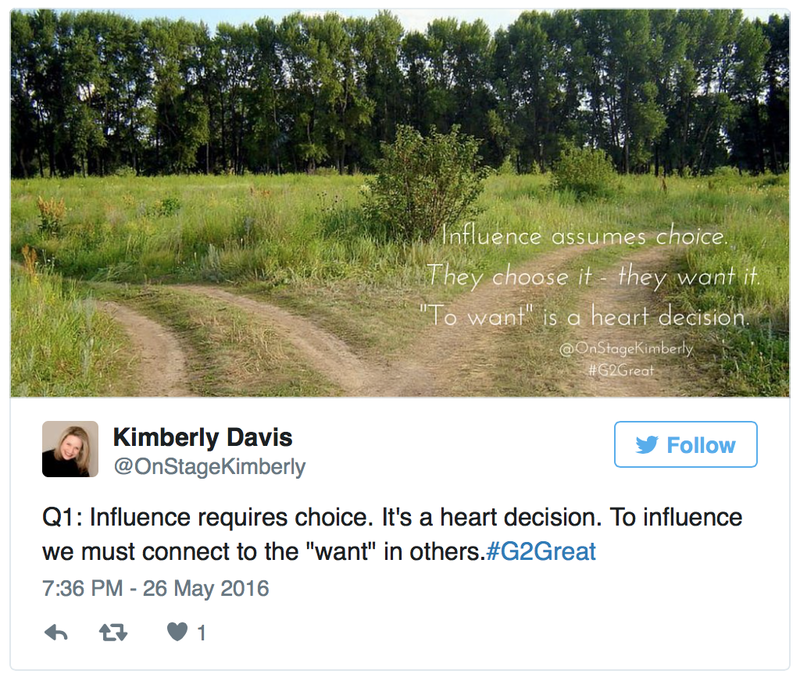 Texts are chosen with a purpose and audience in mind, similar to when we write. 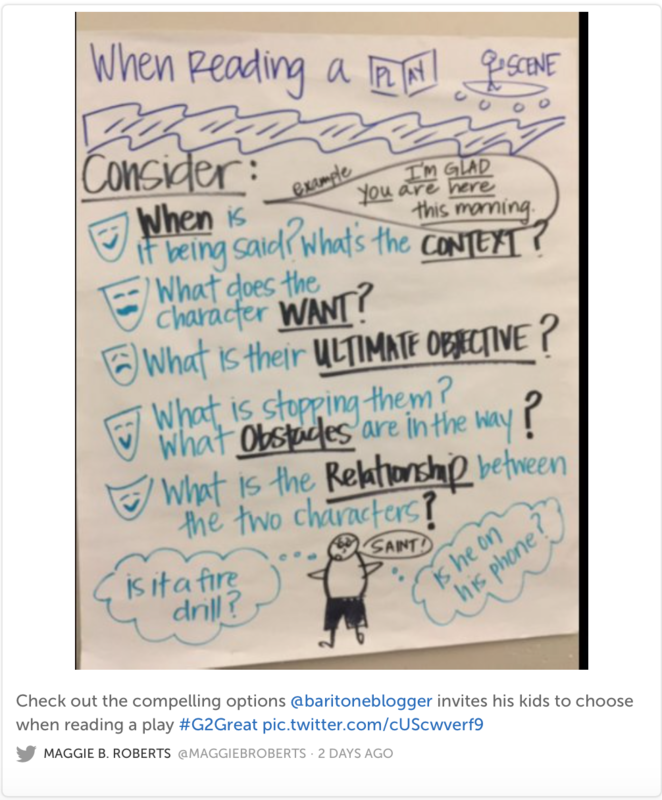 The purpose of the text may be for a read-aloud, a shared reading experience, a close reading, a mentor text for writing, or a touchstone text for reading. 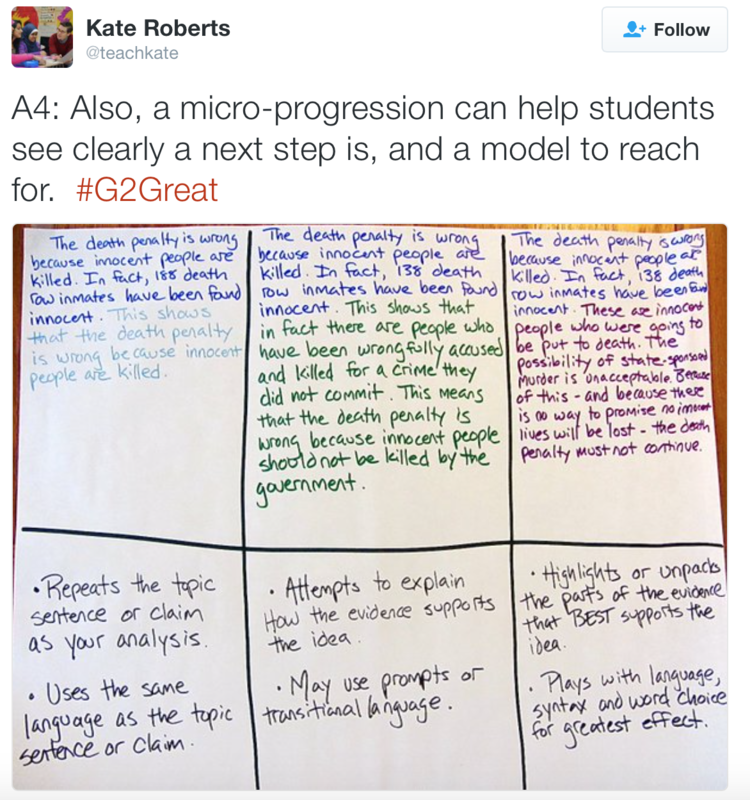 The purpose for text selection could be to teach a particular strategy to the class or a small group strategy lesson. We are even intentional in the way we expect our students to choose their independent reading books, as our intention comes through as a model for their own practice in text selection. There is real beauty in that. The audience (students) I would argue is even more important than the purpose, because without the audience we would not be able to choose a particular purpose. 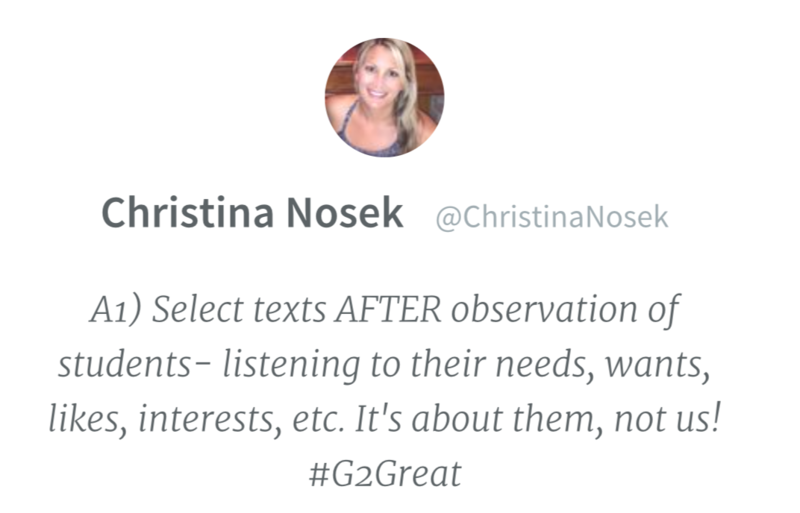 “It’s about them, not us!” was the clear message that came through the Twittersphere as Christina Nosek (@ChristinaNosek) said it so clearly. This charge should be shouted from the mountaintop. We need to consider our students strengths and weaknesses, their interests and experiences in order to select the books. The relevance of a text to the student greatly impacts the learning that follows. 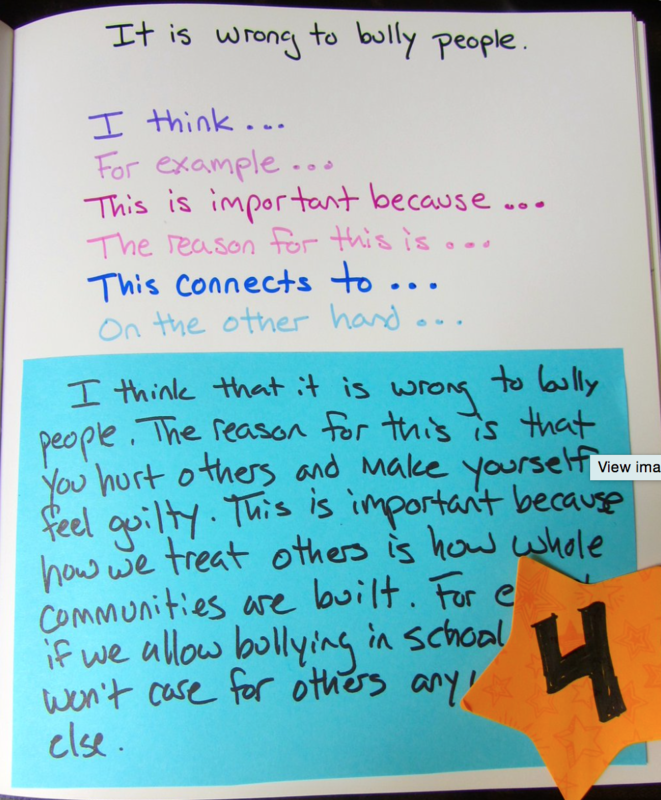 The relevance comes through a text and speaks to our students, it shows them how we know them and that we have established a relationship with them. 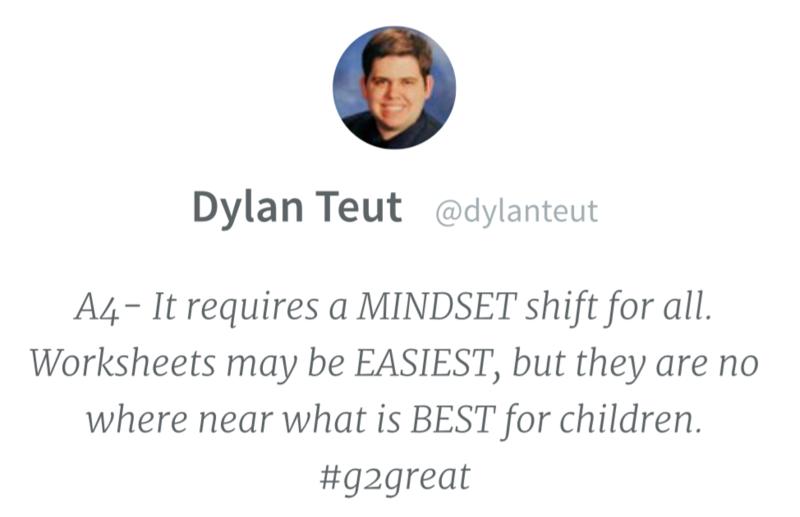 Selecting texts must be based on the students in you are choosing it for, those students right there in front of you. If we want results in reading instruction we must be intentional in our text selection. 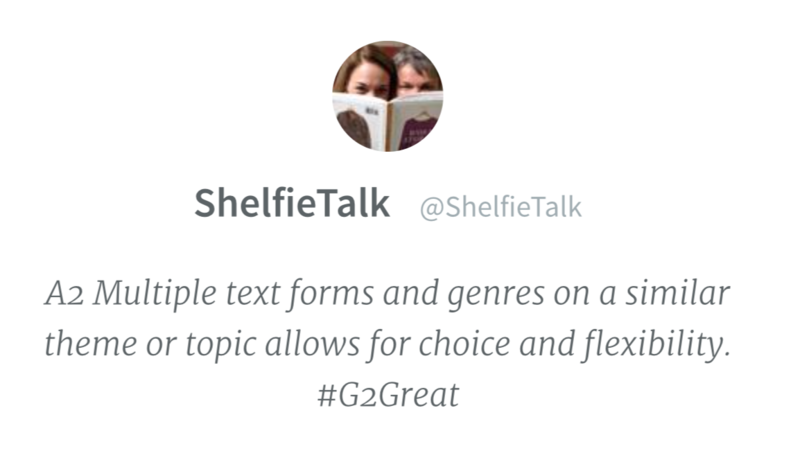 In selecting texts we always aim for a healthy balance, much like in life. 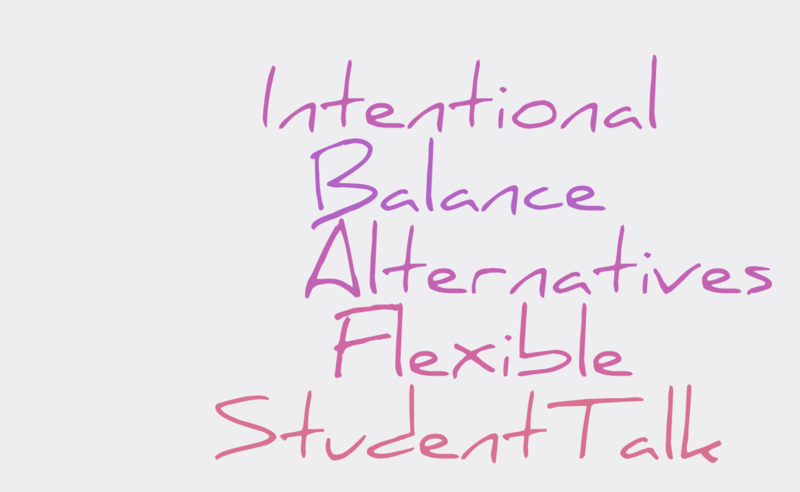 As dedicated connected educators, we are always trying to balance our professional and family life. 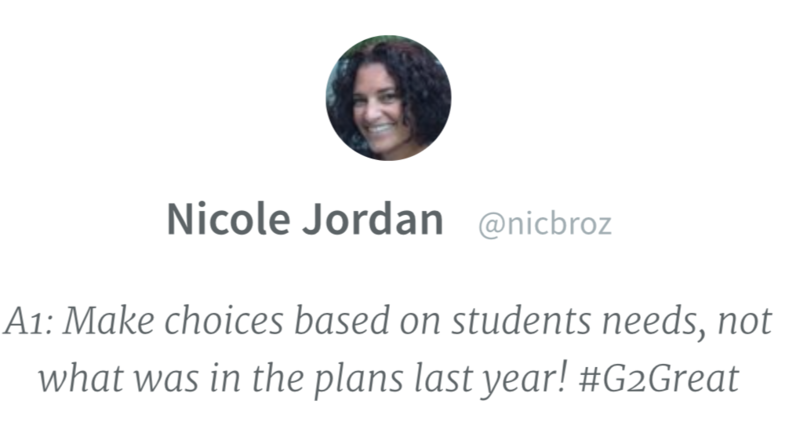 This is the same balance we need for choosing texts for enjoyment and texts for instructional purposes. The balance can come in different ways. For example, I know every text I read teaches me, changes me and makes me grow. This includes books that I read for pleasure or books I read professionally. In that sense there is balance. 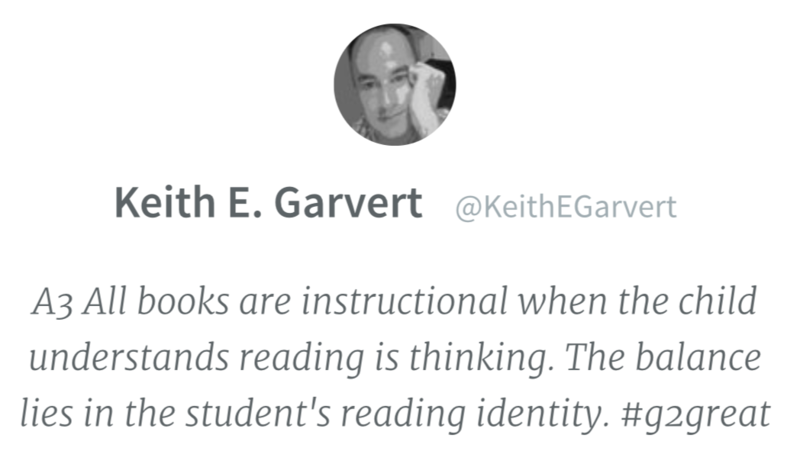 Keith Garvert (@KeithEGarvert) pointed this out so well in his tweet captured below as he clarifies that reading is thinking. 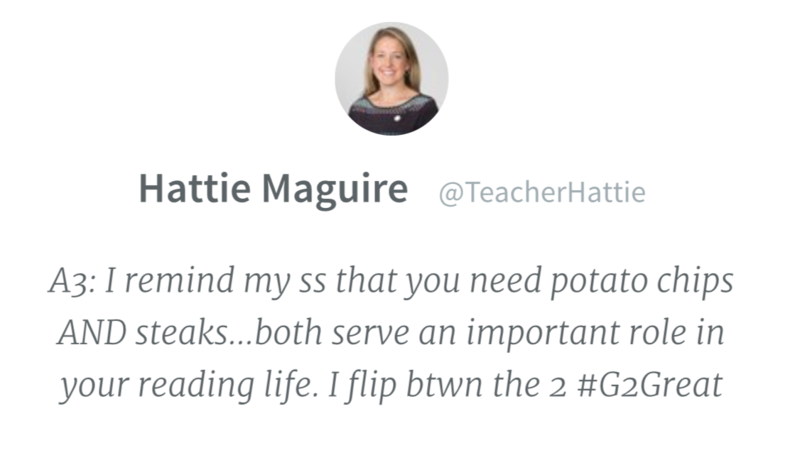 Hattie Maguire (@TeacherHattie) brought a great metaphor to the #G2Great table and shared that she reminds her students that they need potato chips and steaks as both serve an important role in a readerly life. We are well aware that the research shows that thoughtless questions, worksheets and agendas can derail our efforts to deepen understanding. 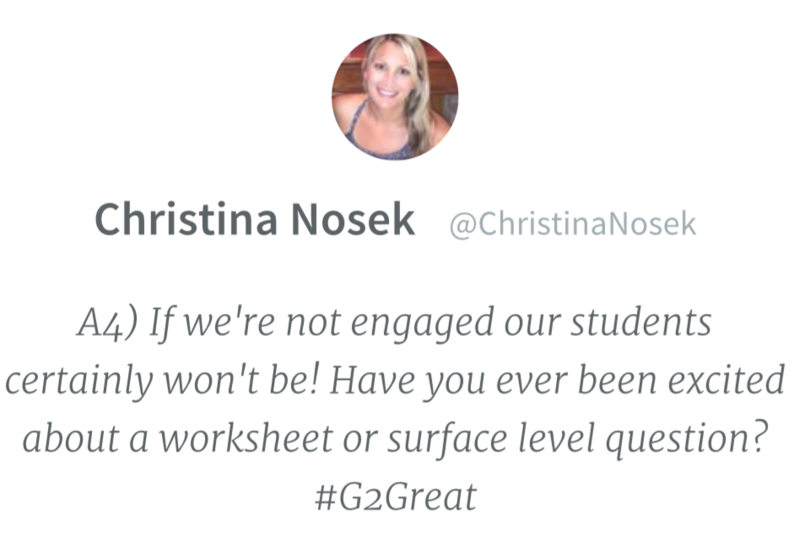 Following this statement we asked the question, “How do we spread that message and offer alternatives?” We received so many great responses related to opening doors and sharing alternatives with colleagues. 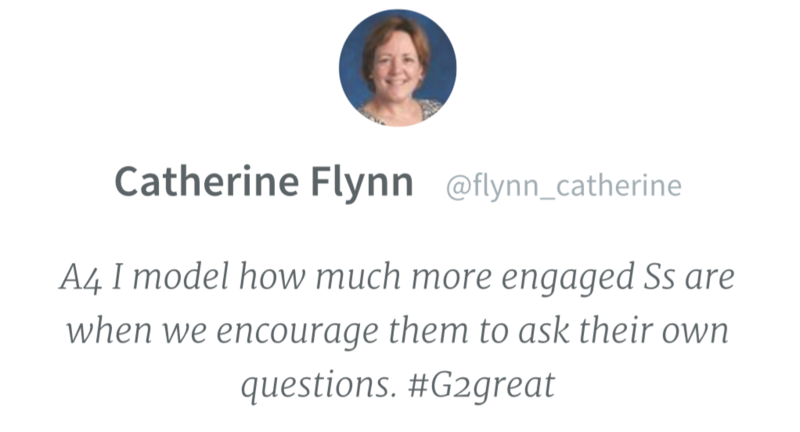 We know that all learners need to see a model, to watch that demonstration in action. Our colleagues need to see this possibility too in order to try out some of the alternatives to old ways that we know now are not enough. 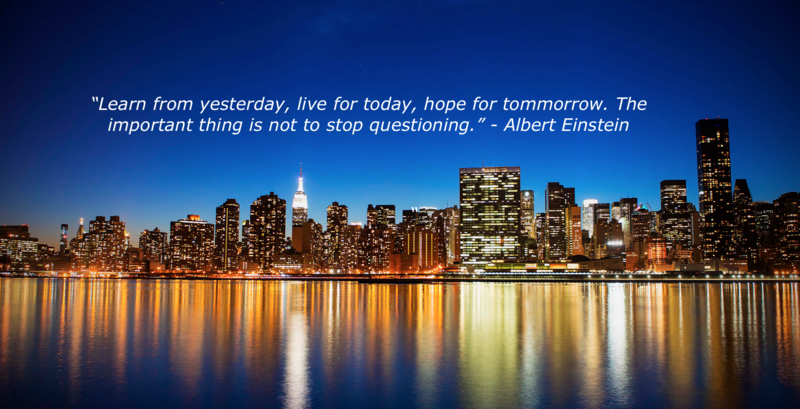 This is especially important for our colleagues who may not be connected yet and do not have immediate access to the great progressive minds who push our thinking every day. 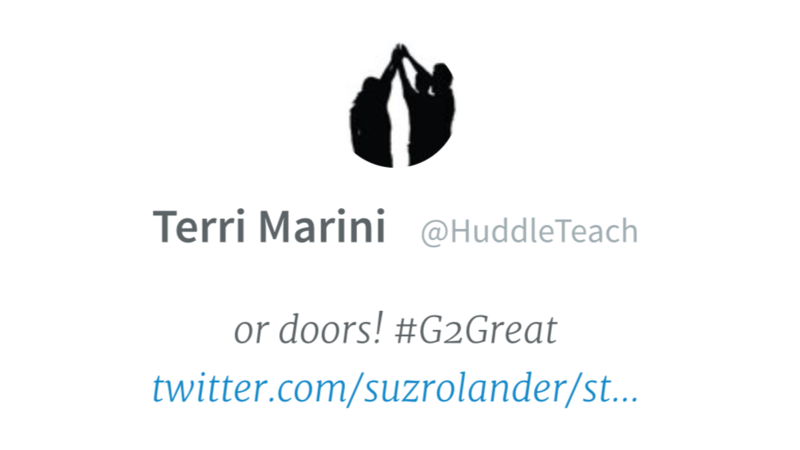 For those educators, we must open our classroom doors and invite them in so they can see the engagement, the thinking and what our students can do through dialogue, meaningful responses and self-questioning. 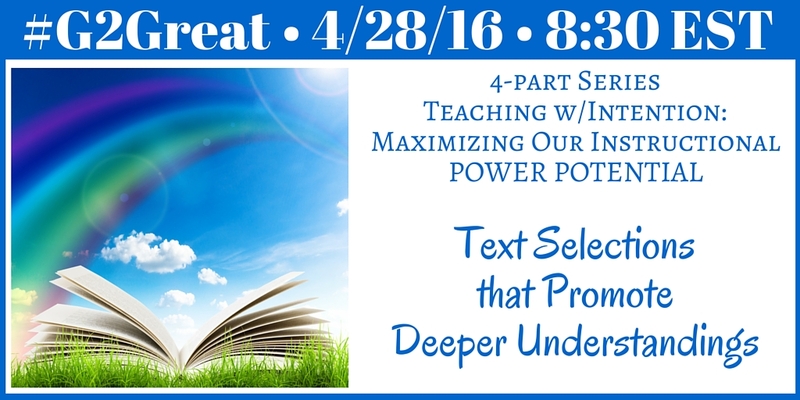 In order to deepen understanding we need to use text selection as a flexible instructional tool. 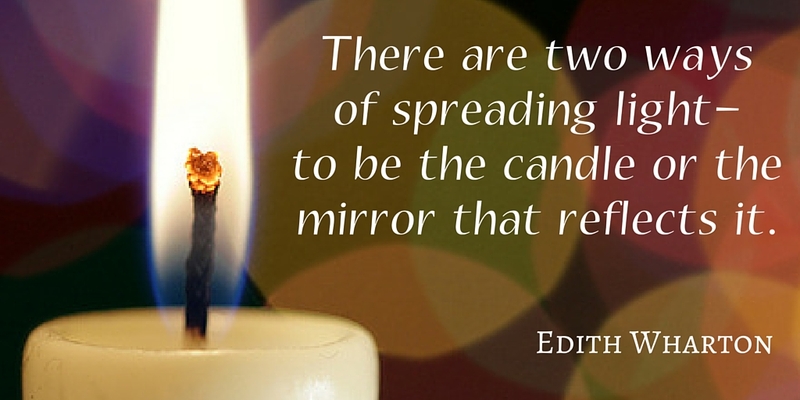 Flexibility is intertwined into the other words I have highlighted in this post. Without flexibility we cannot reach all students. 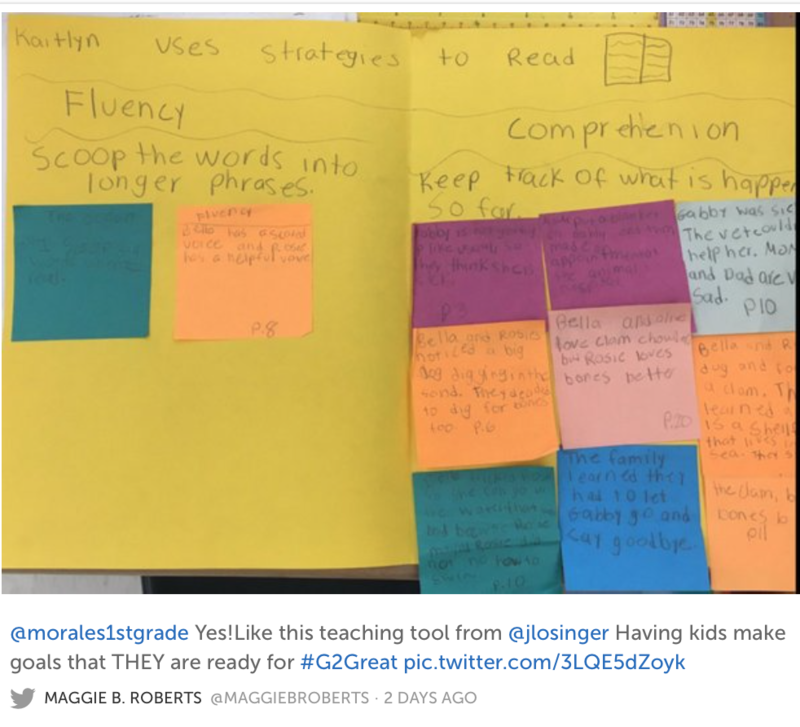 Offering students multiple texts from different genres and layering these texts in order to build knowledge and increase the depth of comprehension can have a powerful impact. 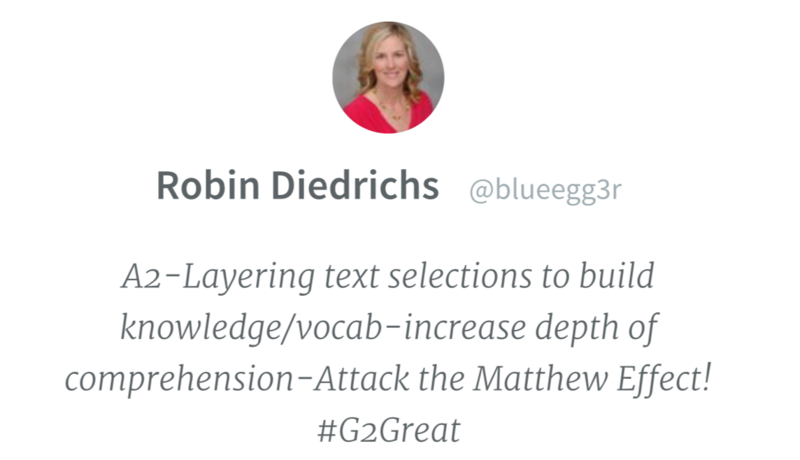 Robin Diedrichs (@blueegg3r) calls on educators to “attack the Matthew Effect!” The Matthew Effect essentially says, “The rich get richer and the poor get poorer” and in the sense of reading, students who come to school better prepared with richer literacy experiences then find themselves with what sociologists refer to as “accumulative advantage.” This idea has been discussed by Malcolm Gladwell in his 2008 book, Outliers and also coined in education by Walberg and Tsai in 1983 to describe how some students quickly develop literacy skills and others who enter school already behind do not catch up and the gap widens. Being flexible in text selections can help to close the gap for students, especially when it supports building knowledge and vocabulary and increasing deeper comprehension. Last but certainly not least, student talk at the center of our classrooms shows us the evidence of transfer as their understanding deepens. 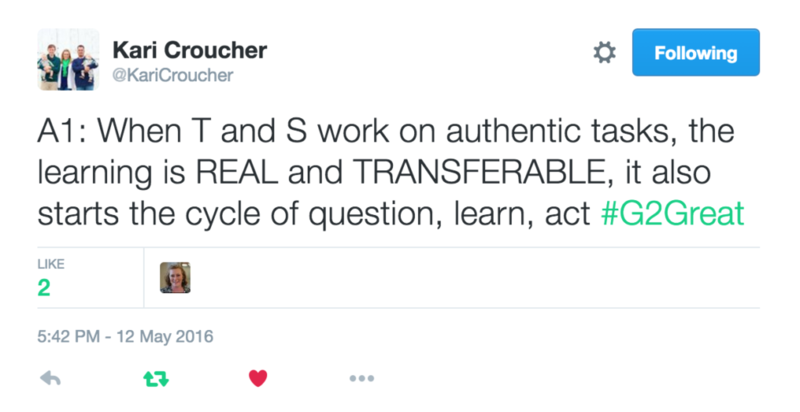 We ensure this by creating structures to foster student talk and then by leaning back and just listening. Listening to our students as they share their ideas and thinking around books. 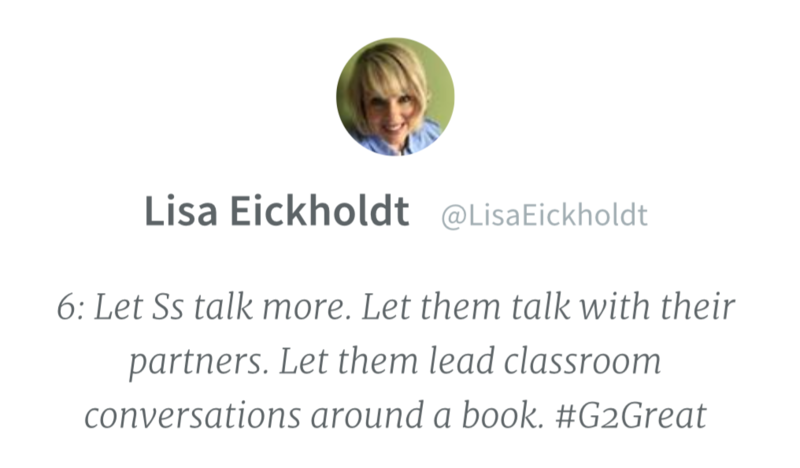 Teacher talk should decrease and student talk should increase. 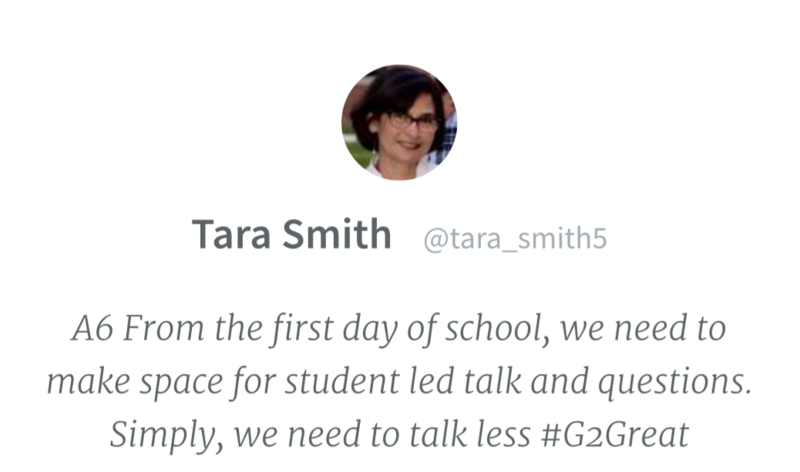 Tara Smith (@tara_smith5) says it well in her tweet “From the first day of school, we need to make space for student led talk & questions. Simply, we need to talk less. 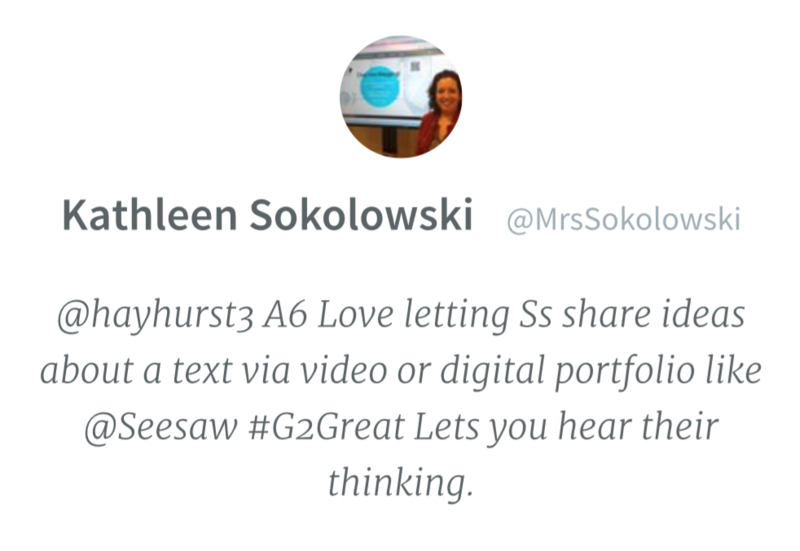 Our collective thinking each week at #G2Great always leave me with a mind that is full of ideas and I have that feeling of excitement that comes just after learning something new. 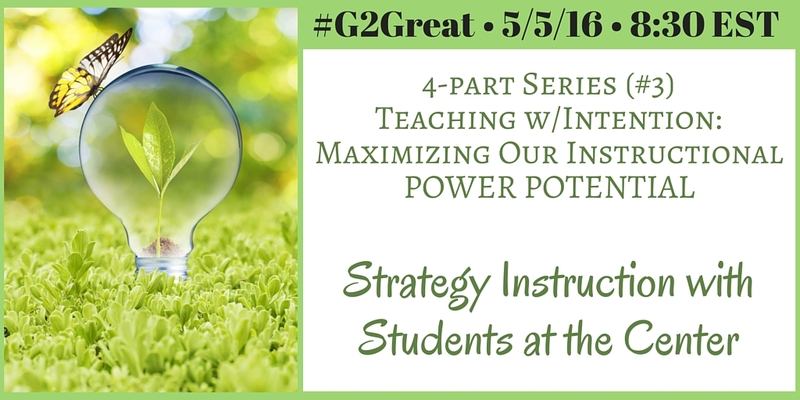 This four-part series offers an opportunity to grow with us as we explore teaching with intention in order to maximize our instructional power potential. 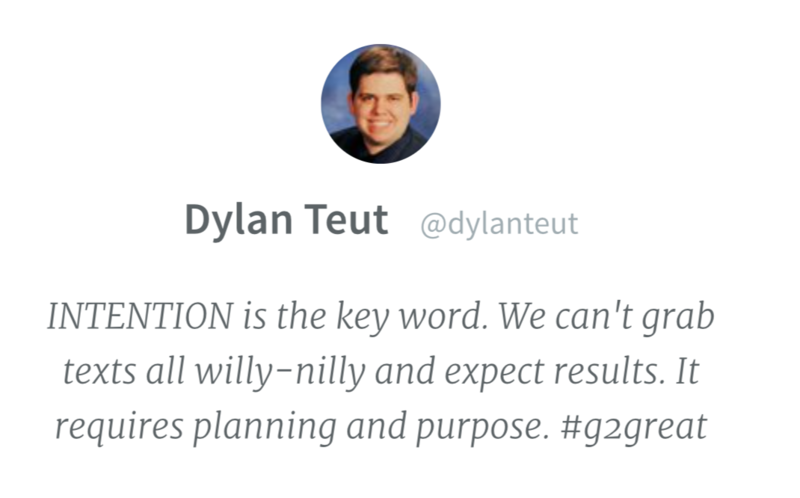 Join us in the coming weeks to help us grow ideas and learn together.